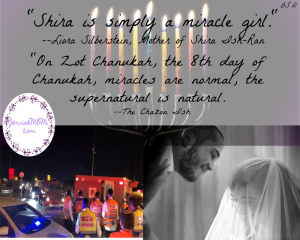 From the Jerusalem Post: “That night,” Liora Silberstein said, “at the hospital…20 people participated in her surgery, which took from 10 p.m. to 4 a.m., said Liora, who explained that she passed the time by praying and reciting Psalms in hopes of a miracle. “There was a brief scare in the middle of the operation, where it seemed like they might lose their daughter, but then the doctors were able to right the situation. “For an hour-and-a-half, Liora said, she believed she could lose her, but miraculously, the bullet missed all her major organs and her daughter survived the surgery. “Today she woke up and asked for me,” her tear-stricken mother Liora Silberstein said on Monday evening, as she recalled that emotional moment for The Jerusalem Post.